Poststroke aggressiveness is very frequent but it is not a medical diagnosis. Moreover it corresponds to behavioral changes that are related to the emotion of anger. They associate variably with the anger trait, hostility, impulsivity, disruptiveness, confusion, agitation, anxiety, depression, and some cognitive changes which could be specific or not to the localization of the vascular lesion. For assessment purposes, it is important that poststroke aggressiveness represents a significant change in comparison to the prestroke condition and that it has sufficient clinical severity to be considered distressing on personal and social patterns of functioning. The link between aggressiveness and regional brain dysfunction is still poorly understood. 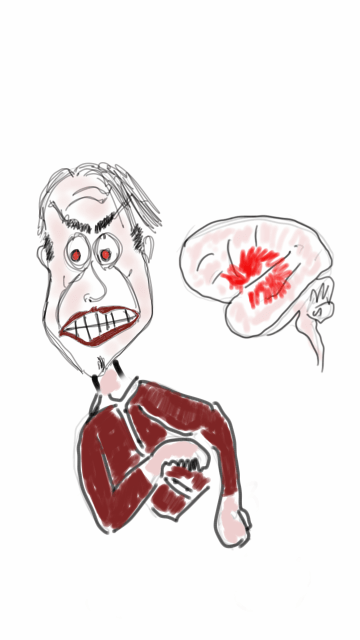 catastrophic reaction, aphasia and other left hemisphere syndromes; misoplegia, somatoparaphrenia, misidentification disorders, and other right hemisphere syndromes; poststroke delirium, mania, psychosis, and mood disorders; poststroke pain and fatigue conditions; and vascular dementia). Do you employ other definitions or classifications for poststroke aggressiveness? Questa voce è stata pubblicata in Cerebrovascular diseases, Cognition and Behavior, Stroke. Contrassegna il permalink.